During the Worldwide Developers Conference keynote last month, Apple teased new animated emojis for the Messages app in iOS 10. 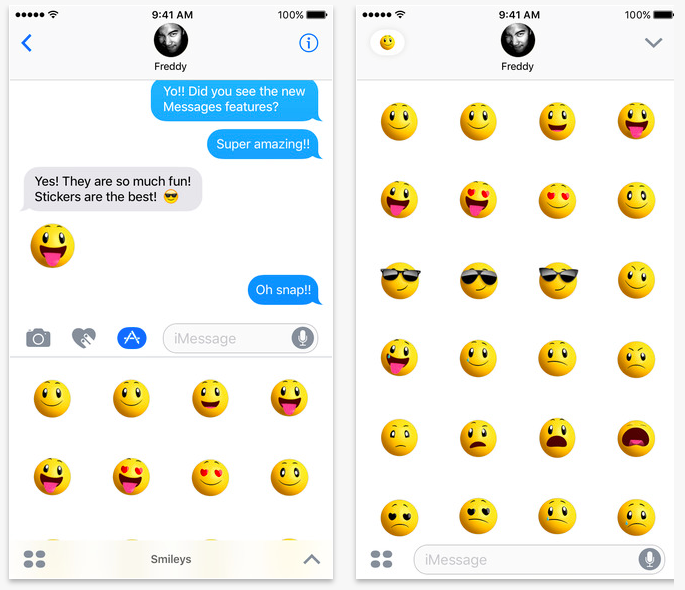 A couple of days ago, the company has finally released four stickers packs to be used on the first beta of the new mobile operating system. The stickers are currently available only for developers and all those who have installed iOS 10 on their compatible devices. If you are one of such users, you can download the four sticker packs right now. The app called Smileys is available on the App Store for free. Put a smile on anything with this sticker pack of animated smiley emojis. You can peel and place these animated emoji stickers on anything in your conversation — bubbles, images, or even other stickers. If you are still on iOS 9, don’t worry. Apple has promised that it will launch an iOS 10 public beta testing program in July, so very soon you will get an opportunity to install it on your device and enjoy the new features of the updated firmware version.